Dreamscaped Designs: Fantasy Faire is Coming! Hello Dreamers! The Faire is coming! The Faire is coming! 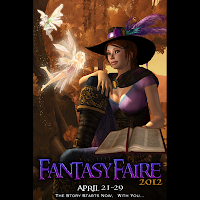 I hope you can join us at the Fantasy Faire this year to support ACS - Relay for Life. Dreamscaped Designs will be there! I am so excited! Come see the enchanted forests and fantastical builds. It's an amazing experience. My store will be located on the Shadow's Claw sim. Donation kiosks are currently located at the main store. Looking forward to seeing you there!